A wild, intense, action-packed movie that gives the film series a satisfactory conclusion. ...InuYasha and friends do a Lupin III-style island adventure. 50 years ago, InuYasha and Kikyo discovered Horai Island, a place where time stands still that is inhabited by a group of mysterious half-demon kids. However, they were swiftly repulsed by the Island's true rulers, a powerful group of demons known as the Four War Gods. Upon the leaving, they see the Island fade into the myst, never to be seen again. Until now: After 50 years, the Island has returned, and one of the half-demon kids has escaped, rushing to InuYasha with a desperate plea to rescue her friends. But in order to do so, they'll have to defeat the Four War Gods and discover the truth behind the real nature of the mystic island. The final film in the InuYasha franchise uses pretty much the same concept as the first: An action-heavy, simplistic, straightforward story. Kill the demons, save the kids, go home. It's simplistic and doesn't develop any of the main franchise plot, but it does a lot to compensate: better backstory, a likable cast of one-time support characters that do a lot to keep you engaged with the plot, and it keeps the main cast together for most of the film. It's also easily the best looking of the InuYasha movies, which is really saying something--brilliantly detailed and executed backgrounds, stellar animation, and exciting, varied action scenes. Plus the great theme music--it's present, it's awesome, end of story. Unlike the conclusion of the TV series, the film series ends on a positive note. A few minutes more to spend on character development to balance out the action would have been nice, but this is still a solidly above-average action/adventure film that most InuYasha fans will enjoy, as well as a moderately effective finale for the movies in the franchise. The final film in the InuYasha franchise uses pretty much the same concept as the first: An action-heavy, simplistic, straightforward story. Kill the demons, save the kids, go home. This one has a better backstory, going into great detail about the Island's tragic history--how it started as a human/demon utopia before being converted into the demon gods' feeding ground--while also doing a better job of using the secrets of the island to set up future events. But it doesn't change the fact that plot is just about killing demons to save the day, while the character interaction and development between our heroes, easily the best feature of the TV series, is minimal. Still, if you like great action scenes enough to do without, then there is plenty to enjoy here. The fight scenes are excellent, all the main characters are heavily involved from start to finish, and the Island setting provides them with a good variety of locations and settings. That, combined with some decent villains and extra support characters, makes this a fairly satisfying end to the movie titles. In a way, a large portion of the film feels like one long action scene with few mild breaks here and there for storyline's sake. The first takes place right after the opening battle, where the crew learns of the other children on the mystic Island and forms a plan to go there. The next takes place later on to reveal the history of the Island and the reason the half-demon kids are bound to their fate. Almost all the rest of the film is fighting, which may understandably disappoint some InuYasha fans who watch mostly for the character-interaction drama. Fortunately, that is still present in some form throughout the movie. At the very least, the main characters are all together for most of the film, rather than simply bumbling along on their own and occasionally running into each other by chance. Even when they split up, they are usually within the same vicinity and still working toward the same goal. More importantly, when it comes to the action scenes, no one is left out. After the near-criminal disregard for Miroku, Sango, Kirara, and Shippo in the last movie, this was pretty much an obligation, and I'm glad to say they fulfilled it very well. Best of all, with four main villains instead of one, there are plenty of "boss fights" to spread around among the team, and that's exactly what happens, allowing certain members to split off and take some of them on without InuYasha's help. After all the spotlight-hogging he did in the last two films, this was a welcome change. The four gods themselves are are somewhat mixed in terms of quality. They are competent for the most part, but well short of what I would expect from gods. Now, to be fair, it's never stated that they actually are gods, so they could just be using the title for propaganda reasons, but gods or "Gods" I expected a bit more from them. At least they are distinctive, with each of them having a unique fighting style--creating fire pillars, flying, shooting artillery projectiles--all requiring the members of Team InuYasha to adapt in order to overcome. Also, a lot of the fights are a bit more creative than "see enemy, hit with pointed stick and throw energy wave." Another thing I really liked about this film was the half-demon kids that inhabit the Island. For one-time support characters, they are a pretty likable bunch, handling their miserable situation with a fair amount of courage and poise, but not so much as to go beyond believable. They showed a realistic level of maturity and intellect for their age without being excessively cute or annoying, and within a few minutes of their introduction, they are established as people who really are worth the extra effort to save. Always nice when the main goals of the story involve people you can really root for. In terms of animation, I would say this is easily the best of the InuYasha movies. The mystic Island setting provides a plethora of great locations, some natural, some supernatural, but all of them brilliantly detailed and drawn. Overall, the movie has a more dark and gloomy feel than the other ones, taking place entirely at night in a land that was once a peaceful paradise, but has been turned into a demon-ruled nightmare. The stellar animation helps contribute to this atmosphere quite well, showing off places like dismal ruins and abandoned towns. It was a nice change of from the more typical InuYasha episodes. Another high point of the movie is the great InuYasha theme music, which is effectively used during a lot of the battle scenes. I've mentioned this before in my reviews of the other movies, so there isn't much else to say here. It's present, it's awesome, end of story. Like I said before, the main weakness of the movie is the lack of an ultimate goal at the end of the story beyond killing demons as the solution to all problems. It also isn't helped by the utterly pointless appearances of Sesshomaru and Kikyo. Sesshomaru's role in this movie is a bit more productive than in the first one, but still totally unnecessary. All he does here is show up to fight one of the Four War Gods. No explanation is provided as to why (which is certainly consistant with the series, his motives are rarely well explained), and it's not a job InuYasha's team couldn't have handled on their own. Kikyo comes along as the conclusion of a bizarre plot involving the War Gods using her DNA (or something to that effect) from their first encounter 50 years ago to create a replica of her in order to fight InuYasha, which causes some problems for him as he is reluctant to attack the image of his old love. This is by far the stupidest aspect of the story. Why would InuYasha have any moral qualms about killing something he knows is just a replica created for the sake of killing him? The resemblance of Kikyo shouldn't make him reluctant to fight when he's 100% sure it's a fake, nor should he require the real Kikyo's aid in dealing with it. Overall, the InuYasha films are a lot like the episodes of the TV series they are based on: They are wildly inconsistant in terms of quality, varying back and forth from excellent to average. But, unlike the conclusion of the TV series, the film series ends on a positive note. Once again no aspects of the central plot in the InuYasha franchise are developed any further, but this is still a solidly above-average action/adventure film. This is the only InuYasha movie shorter than 100 minutes (90), and I think some extra time would have helped improve the story and balance out the action a bit better with some much-desired character interaction, but the final result is still something most InuYasha fans will enjoy, as well as a moderately effective finale for the movies in the franchise. Fire Tripper uses the same concepts as InuYasha in a more serious and dramatic mood, while Fushigi Yuugi has so many identical concepts its amazing they are not based on each other in any way. For some decent island adventures in a modern setting, check out the Lupin III films Island of Assassins, and Voyage to Danger. Part of the InuYasha franchise, which began life as a popular 56-volume manga series by Rumiko Takahashi, published between 1996 and 2008. 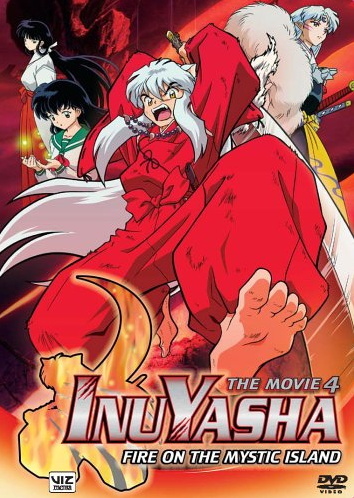 The manga spawned a 167-episode TV series, four movies, nine video games (Four of which were released in the US), and, most recently, a sequel TV series consisting of 26 episodes to complete the story called "InuYasha: The Final Act." The subtitled version of that series is already available streamed in North America, and the dubbed version is scheduled for release some time this year. Fire on the Mystic Island is the last of four InuYasha films and the only one made after the original TV series was over. The others were released after episodes 54, 95, and 136 respectively. The setting of the film, Houraijima ("Hourai Island"), is a reference to a fabulous paradise from Chinese mythology. Pronounced "Penglai" in Chinese, the mythical land was said to be a mountain on one of five islands inhabited by immortals. The legend migrated to Japan, where it is pronounced "Hourai." Viz's English title isn't entirely inaccurate, as the word Hourai is occasionally used to refer in more generic terms to sacred mountains, such as Mt. Fuji. The DVD (available alone or in a set with the other three movies) lists Japanese and English audio, non-widescreen video (? ), an English subtitle track, and promo videos for an extra. Falls into about the 10-up range on account of action movie violence. InuYasha Movie 4 is Copyright © Toho - Rumiko Takahashi Any images are the property of their respective rightsholders, and included for review purposes only under the fair-use clause of US copyright law.